If you're setting up our HTML5 webcam API, have successfully embedded a Clipchamp button on your website but are seeing a button text of "unavailable" when you click it, there is a high chance that you haven't set your domain(s) in the API settings yet. To get the button to work, go to the API settings at util.clipchamp.com/api-settings and enter the URL of the websites where you want to embed 1 or more Clipchamp button(s). If you entered your domain(s) but the button still doesn't work, check that your internet connection is still connected and that your API key as well as the header script are both correctly entered and placed in the header of the page where you want a video button to get embedded. Please contact us through the contact widget on this page if the button on your website still does not appear after these checks. 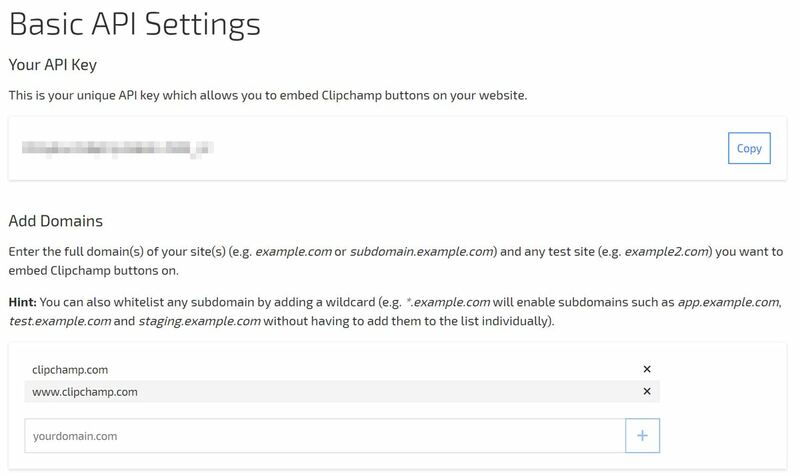 Also, please have a look at this article that walks you through the Clipchamp API setup steps.